Over the past few years, the number of instances in which Internet access was blocked for entire regions by the Indian Government has been steadily climbing. These “Internet shutdowns” are usually instituted as responses to conflict situations i.e. to prevent rumor-driven escalations of civil unrest, but they are also instituted at times for reasons far more trivial, such as to prevent cheating during examinations. This rise in frequency and broadening of reasons behind shutdowns even in the face of strong international condemnation of the practice are causes for concern as they not only threaten the democratic working of nations, but also point to the gradual normalization of the mindset that permits such blanket restriction on Internet access. SFLC.in maintains a dynamic “Internet Shutdown Tracker”, which contains detailed records of all Internet shutdowns reported from 2013 and presents this data on an interactive map. 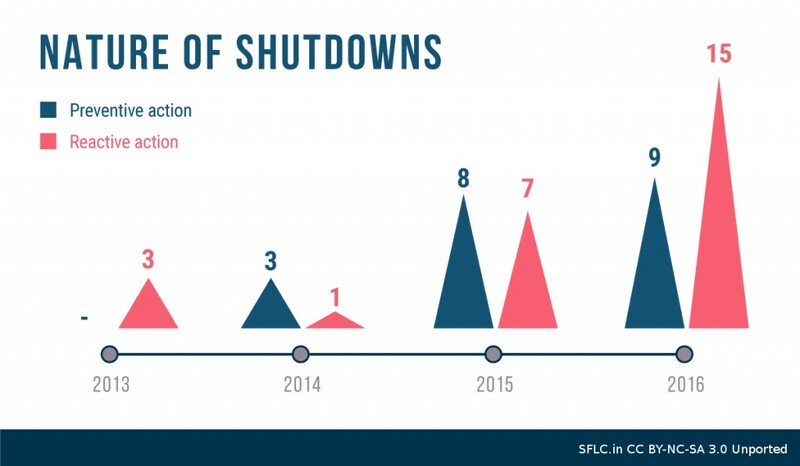 As of December 1, 2016, 46 shutdowns have been reported across 11 Indian States, with the State of Jammu and Kashmir topping the list at 19 shutdowns instituted between 2013 and 2016. Mode of restriction: Whether the order issued restricted mobile, fixed line, or both the modes of connecting to Internet services? 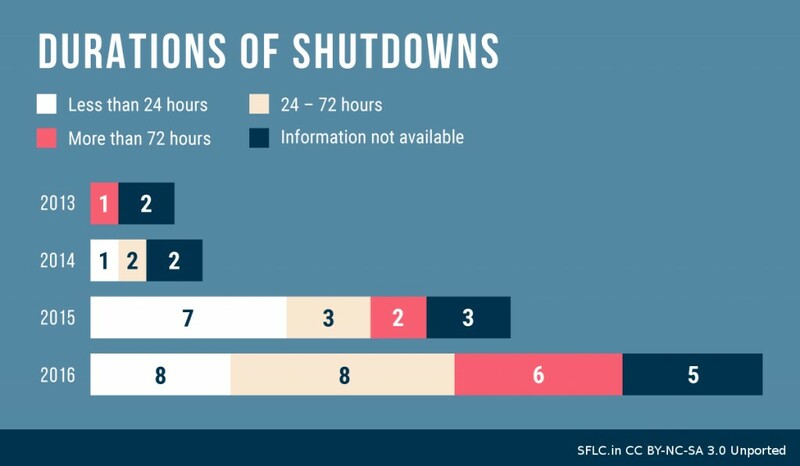 Duration of the shutdown: Ranging from less than 24 hours to more than 72 hours; how long was the Internet shutdown instituted for? Nature of the shutdown: Was the Internet shutdown a preventive measure taken in apprehension of an event, or as a reaction, post the occurrence? Of the 46 reported incidents, 32 were targeted at mobile Internet services (3 shutdowns each in 2013 and 2014, 10 in 2015 and 16 in 2016), 14 targeted fixed-line Internet services (1 in 2014, 5 in 2015, and 8 in 2016), while no shutdowns targeting fixed-line services alone were recorded during the period of study. 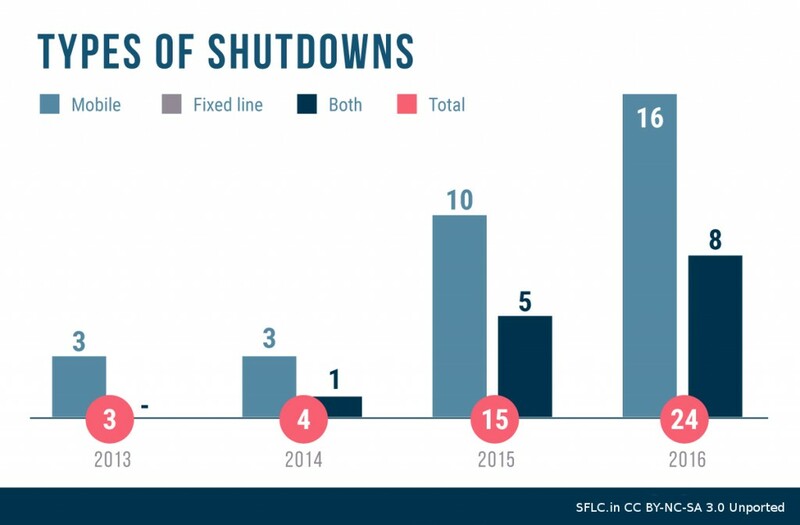 16 of the 46 Internet shutdowns between 2013 and 2016 lasted less than 24 hours, 13 lasted between 24 and 72 hours, 9 lasted for over 72 hours, while no information was available on the respective durations of 12 Internet shutdowns [See Fig. 2]. The non-availability of information is attributable chiefly to the fact that no public notifications are issued by the Government before, during, or after shutdowns, leaving stakeholders outside affected areas to source this information from available news reports, which do not consistently mention the durations for which Internet access was blocked. Furthermore, a sum total of 20 Internet shutdowns between 2013 and 2016 were observed to be preventive measures i.e. restrictions imposed in anticipation of public unrest, whereas 26 shutdowns were reactive in nature i.e. imposed in order to contain on-going unrest. For a complete catalogue of every Internet shutdown in India along with external references, please visit our Internet Shutdown Tracker at: http://sflc.in/internet-shutdown-tracker-india-2013-2016/.